Thank you for writing, Mr. Feynman. Today is the birthday of Richard Feynman, the great scientist, poet, storyteller and merry prankster. It’s hard to write about him because I know I can never do him justice, and because sometimes when I read over his words I get all heartachey. I think of him as a mentor, even though I can’t — and probably never will — truly comprehend his scientific achievements. He worked on things like quantum electrodynamics, particle physics and superfluidity, which, as far as I can tell, means he knew how to lift up the hood of the universe to see how it ticked. I don’t understand what he saw under there (mind you, as he liked to point out, he didn’t understand it either), but whatever it was humbled and delighted him. Feynmann taught me that laughter and compassion are the highest forms of understanding, that scientific knowledge only adds beauty to the universe, and that we should follow our hearts to discover the things we love, and then learn about them our own way. He was also fearless when it came to facing reality. He looked the universe right in the eye, saw that it seemed ancient, brutal and filled with mindless cycles of creation and destruction, and then he skipped around gleefully, banging his bongo drums and telling everyone about how little we really know about anything. “I think it’s much more interesting to live not knowing than to have answers which might be wrong.” <<< I could love him for that line alone. 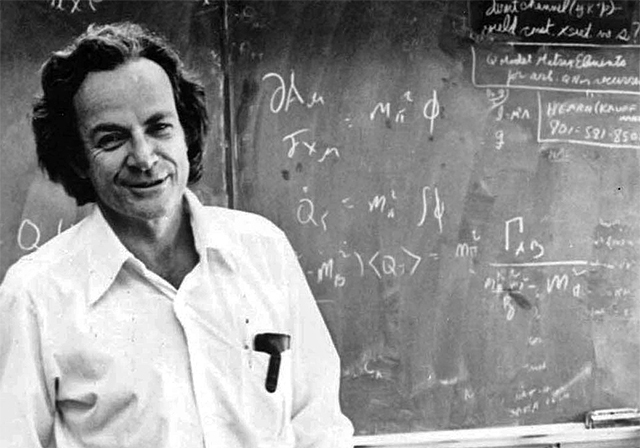 Feynman is one of my signposts for how to spend time wisely, playfully and humbly. Whenever I see people behaving badly (quite often, if I read the news) and feel kinda down about it, I read some of Feynman or watch his lectures to remind me how awesome humans can be, and how little time there is for bickering, pettiness or laziness when instead you can be curious, merry and in love.